In many ways, we live in a ‘less is more’ era. We favour minimalist interiors and personal styling is pared back in comparison to the fashions of eras gone by. Our technology gets smaller by each passing year and the variety of foods we eat seem to become narrower all the time. Less is more is our go-to setting and, as we grow to learn and care for the health of our bodies and the global environment, it’s hard to see this outlook changing any time soon. But, every now and again it’s nice to have a different take on life, and choosing a new bed is one of those refreshingly antidote ‘more is more’ moments. It’s hard to think of a time when we will seek out ‘lesser’ qualities in a mattress, or for our sleep for that matter. We don’t go bed shopping with the aim of finding mediocre comfort, a compact sleeping surface or a bed that will tide us over for a short period of time. No, more is definitely more when it comes to our sleep needs and, happily, we don’t see that changing anytime soon. At Millbrook Beds we don’t just like to see people get more from their sleep, we love to see them get the most. 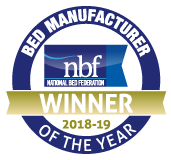 Our approach to handcrafting luxury beds and mattresses using the finest natural fillings firmly subscribes to a ‘more is more’ outlook so, go on, indulge yourself in just this one are of life.